In recent years Robert Harrop Designs have brought us some excellent collectable figurines including classic characters from The Beano and Roald Dahl books. More recently they have stepped into the world of 2000AD, introducing characters from the Judge Dredd series. 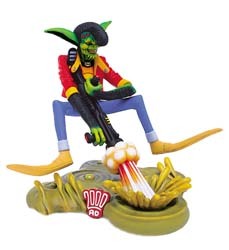 The company's latest releases in the 2000AD range sees everyone's favourite delinquent duo D.R. and Quinch immortalised as extremely collectible figures. The D.R. statuette is slightly cheaper than the Quinch figure, but is much more animated showing D.R. firing his blaster into the ground, with the recoil sending him hurling backwards. Sculptor Matt Buckley has done a first rate job of producing a very collectible ornament which will take pride of place in anyone's home. But, where this figure really stands out is the fantastic job they have done of hand painting it. There is some great shading on D.R. 's T-shirt and the careful brushstrokes on the gun's explosive discharge is wonderful. If you have £85 spare then buying both D.R. and Quinch could be one of the best investments you make this year. If that will break the bank, then you can probably do without Quinch, but you have to get your hands on D.R. I'm looking forward to Robert Harrop Designs next launch in this series.